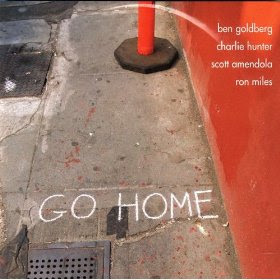 NOTES ON JAZZ: Ben Goldberg with the help of Charlie Hunter finds his way back with "Go Home"
Ben Goldberg with the help of Charlie Hunter finds his way back with "Go Home"
The album combines studio music with live performances from a concert in California in 2009. The instrumentation is unique, with Goldberg’s airy clarinet showing influences of Steve Lacy’s exploratory soprano saxophone style. His sound also has deep roots in the ethnic folk music of the eastern European based Jewish Klezmer music, with some New Orleans Dixieland thrown in for good measure. It’s Hunter’s raw guitar work that really grabs your interest. His gutsy, rock-blues sound is strangely compatible with the more polished sounds of Goldberg and Miles. Amendola’s driving drums propels the group with his effective, low-down beat. “Roots and Branches” has influences from south of the border. On “Ethan’s Song” Hunter and Amendola’s intuitive interaction during a live performance is captured in all of its unfettered glory. The uplifting quality of Goldberg’s clarinet inspires a free spirited exchange between himself and Miles often punctuated with precise stops and starts that leave the audience on the edge of their seat. “Inevitable” is a cross breed of down home blues and Ashkenazi celebration music, a weird but effective acknowledgment of the universality of all folk driven music. Without going into the nuances of each of these songs the total album is unexpectedly delightful. It is Hunter’s phenomenal ability to carry challenging bass lines, while at the same time punctuating the songs with his own special brand of blues drenched chords and raucous lead lines, that set this music apart. The groove Amendola and Hunter maintain is infectious and allows Goldberg and Miles the freedom to weave their brass and reed sounds into a magical patois that crosses multiple genres of influence in marvelous and inspired ways. Goldberg wisely sought to work with Hunter, intuitively understanding that the guitarists grounded, unvarnished playing could inspire the clarinetist, back from the fringe of his ethnic and world music explorations, to the get down “Go Home” comfort and joy of this roots based music. (7 string guitar), Scott Amendola (drums); Ron Miles (Cornet, G Trumpet). Tracks: TGO; Wazee, Lace, Roots and Branches, Heads and Tails, Ethan’s Song, Inevitble, Isocceles, Reparation, Papermaker.